enlightenment and continue his bodhisattva activity. Conquering Middle America with the Sound of One Finger Snap. 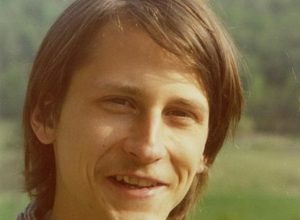 The Sadhana of Mahamudra Feast and Funeral will be performed to celebrate Dan’s life in Halifax on Thursday, Sept. 21st at 4 pm at KCCL. 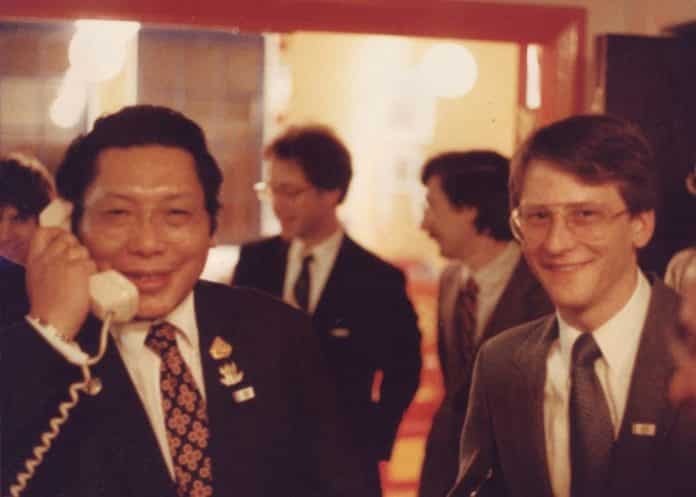 The photo below was taken by The Vidyadhara Chogyam Trungpa Rinpoche just after Dan got his first driver’s license and took Rinpoche out to do some errands. Rinpoche was the first passenger Dan ever took anywhere. Dan and I were friends in our various lives in Boulder, Boston, and Halifax. After his love Karen died (of cancer), he started writing and asked me for help in getting his notes readable. I helped him over the following years with -- besides interminable rewritings of his CVs in various job hunts -- manuscripts on Karen, Kelly, Zara, and... others. (The names were a draw, yes, but the fantastical and insightful gut-level stories got me hooked.) Upon hearing that Dan had only about two more months I knew he was ready for the next chapter of this story we call samsara -- but I thought it was weeks away, not just days. I will miss him more than almost anyone else I know -- we were friends through thick and thin and even -- actually, especially -- at the worst of times he always made me laugh. Thank you, Danny Boy! totally devoted to his teacher. Members of the New York Dharmadhatu often went to Philadelphia for programs and visits. I remember fondly how welcoming Dan and his beautiful wife were to all of us. He was one of the early ambassador's that Rinpoche appointed and he truly worked effortlessly to fulfill Rinpoche's trust in him. Since most of us were very young in the early days, we did think anything of it that Dan was an ambassador at age 25. He was just someone Rinpoche had faith and trust in and Dan delivered big time. Very, very sad to hear of his passing. He lead a truly meaningful life. May it be auspicious. I know you from the early days at Rocky Mountain Dharma Center, over the years, your skill as a carpenter/jack of all trades, conversations with a cigarette in your hand, and more recently, reading your manuscripts. Your writing is true and wild--refreshing like a mountain stream. Your unflagging love for your guru will serve you well in your travels. Go well, stay well, my friend. I knew Dan as a very young man in Vermont. He wandered around the grounds of Tail when I was in long retreat in a cabin. He was then a Milarpa-type yogi..quiet, loved to practice, shy and loved nature. A pure soul with deep understanding and so much devotion to Trungpa Rinpoche and the Dharma. When I think of Dan, I remember the pure and beginning years on the early 70s at Tail..all the freedom we had and a kind of individual wildness being channel by Rinpoche through teachings and practice. I was there in Philadelphia when Kelley Welsh took that picture.The phone rang during a party, and VACT just answered on the spot.From his responses, it was clear VACT was talking to somebody who was calling in for the 1st time. He was so sweet and kind! Maybe that helps you understand Dan's grin. . . ? Dearest Dan, You were an inspiration to me and a guide and a wonderful teacher all those years ago in Philadelphia. You enabled me to continue on this incredible journey we have been on. I have thought of you often and the Philadelphia sangha in the late 70s with all our curiosity for the teachings and all our craziness. "Be horny for the Dharma," you used to say. I will include you in our Medicine Buddha practice which we do on Monday nights on line. "May I not be separated from you, warrior." Thank you again and again. Travel well, Dan! See you next time.